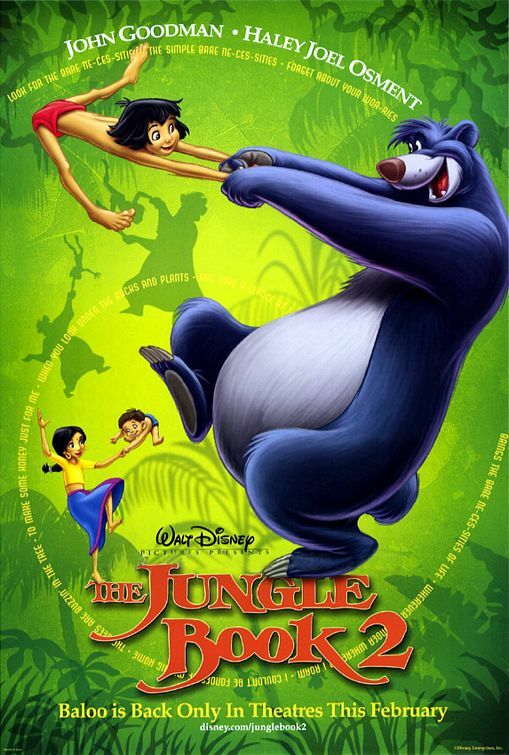 In JUNGLE BOOK 2, jungle boy Mowgli decides to forsake the ways of his family and their civilized life for the "bare necessities" of the wild life with his old friends. The movie is a fun, animated film that upholds family values and rebukes laziness, betrayal and rebellion. The story begins with Mowgli living with a beautiful, affectionate Indian family in a sweet village safely fenced off from the dangers of the big, dangerous jungle. The daughter in the family is little Shaunti, a pretty, obedient child who is intrigued by Mowgli’s descriptions of the excitement of the jungle. Mowgli loves his new family, but the lure of his old jungle life and his old pal Baloo compels him to disobey his new parents and secretly venture farther and farther into the jungle from time to time. Meanwhile, Baloo is missing his little dancing buddy and finds a way to sneak back into the village to steal him back into the jungle. The problem is that the scary, vindictive tiger Shere Khan is hunting Mowgli, too, to destroy him out of vengeance over a past offense. The whole village chases Shere Khan, but Shaunti and her little brother, against the rules of their parents, set out into the jungle to rescue their friend. Is Mowgli a true friend? After he sees his old buddy, Baloo, he becomes enamored with his old lifestyle and Baloo’s lazy, carefree ways and begins talking badly about his family and new friend, Shaunti. After having a big dance session with the monkeys at a secret fort, Baloo begins telling the other animals about the repressive humans and their awful rules. Mowgli begins to miss his family, and he sneaks off a bit, only to find himself standing between the old lifestyle and the new, having to make a choice about where his heart truly lies. But, will he even get to make that choice, or will the awful Shere Khan find him first? With colorful animation, a cute, moral story, fun song-and-dance numbers, and a warm-hearted ending, JUNGLE BOOK 2 will be a big family favorite to round out the winter. A couple of cautionary notes include the fact that the Indian family appears to be Hindu, with the characteristic red mark on the woman’s forehead, but the family is warm, affectionate, communicative, with a perfect blend of “loving but firm” in their parenting style. Lying and backstabbing are portrayed but rebuked through the storytelling, and even lazy Baloo undergoes transformation and is able to make some mature and selfless choices at the end. The other problem is that the movie’s appeal is limited to children under seven or eight. Older children who have been exposed to the recent heart-racing thrills of such movies as SPIDER-MAN were yawning a bit at the old musical style of childhood entertainment. The younger ones laughed and clapped, though, enthralled with the whole picture. SUMMARY: In JUNGLE BOOK 2, jungle boy Mowgli decides to forsake the ways of his family and their civilized life for the “bare necessities” of the wild life with his old friends. The movie is a fun, animated film that upholds family values and rebukes laziness, betrayal and rebellion. (BB, Pa, FR, V, M) Very moral worldview portraying strong families, the importance of obedience, honesty, and loyalty to parents and friends, and conversely, gossip, dishonesty, laziness, duality/gossip are rebuked or shown to be poor choices as well as an Indian woman has a red dot on her forehead, signifying Hinduism, but with no other portrayals; light cartoonish violence with snake trying to hypnotize, capture and strangle two children, tiger trying to stalk and destroy protagonist out of revenge; and, deception, disobedience, lying to parents, laziness, and the two-faced taking of sides against a friend - all rebuked or shown to be faulty, unfruitful ideologies.